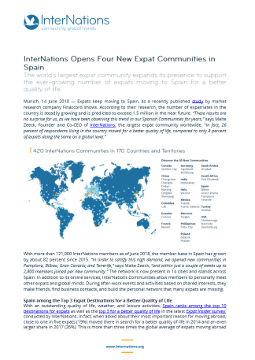 The world’s largest expat community expands its presence to support the ever-growing number of expats moving to Spain for a better quality of life. 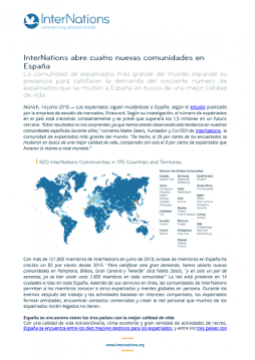 With more than 121,000 InterNations members as of June 2018, the member base in Spain has grown by about 82 percent since 2015. “In order to satisfy this high demand, we opened new communities in Pamplona, Bilbao, Gran Canaria, and Tenerife,” says Malte Zeeck, “and within just a couple of weeks up to 2,800 members joined per new community.” The network is now present in 14 cities and islands across Spain. 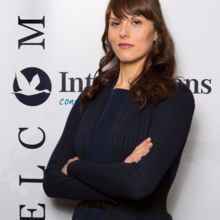 In addition to its online services, InterNations Communities allow members to personally meet other expats and global minds. During after-work events and activities based on shared interests, they make friends, find business contacts, and build the personal network that many expats are missing. With an outstanding quality of life, weather, and leisure activities, Spain ranks among the top 10 destinations for expats as well as the top 3 for a better quality of life in the latest Expat Insider survey, conducted by InterNations. In fact, when asked about their most important reason for moving abroad, close to one in five expats (19%) moved there in search for a better quality of life in 2014 and an even larger share in 2017 (26%). This is more than three times the global average of expats moving abroad for that reason (8%). As reflected by a 90 percent satisfaction rate with their life abroad, expats do not seem to be disappointed with their choice of destination. Expats in Spain particularly enjoy the warm weather (96%) and the “the sense of freedom and happiness”, as described by a British expat. Moreover, with a satisfactory work-life balance (66% positive ratings), it seems like expats have enough time to enjoy the sunny weather and make most of the wide range of leisure activities (89% positive ratings). Maybe this is the reason why almost half of expats in Spain (46%) can imagine staying in Spain forever, whereas globally only 29 percent feel the same way about their new home.